It was a dark day, and my mood matched the clouds. I knew I should be doing something productive, but only wanted to make like my dachshund and burrow under the covers for a couple of years. Let ’em call a search party. I dreaded driving an hour down an excruciatingly boring road in Lancaster County, PA, with nothing to do unless you’re into dodging horse-drawn buggies and manure, to go to a laughter yoga class. I’m a big-city girl. I try to avoid the really country part of where I live as much as possible. But it was the quickest way. I sleepwalked to the car. No umbrella. So what if I got soaked? Sure enough,the skies opened up and I got a free car wash that lasted the entire ride. Across the way was an Amish guy in his Sunday best, peddling a bike. No umbrella. There he was, doing fine. And there I was in an Acura, the windshield growing increasingly foggy from my steaming. What was wrong with this picture? The yoga center through my rainy windshield. Interesting image. But not enthused. A chair waiting just for me. And stuff for bubbles. Oh, joy. But Ernie Oktay, who runs these sessions in suburban Philadelphia, wasn’t fazed. I was no one special. Bad moods were his specialty. Really bad moods. Like a woman whose brother killed himself in her driveway and hadn’t been out of her house for months. Another who had almost died. Those who showed up that rainy Sunday afternoon had varying degrees of happiness. Those who were feeling happy wanted to keep it that way. Others, like me, wanted to learn how to have more. Laughter yoga was started in India by a doctor. It’s known the world over as a stress-buster and immune system booster. Think that’s a bunch of bunk? Former Monty Python funnyman John Cleese would vehemently disagree. Ernie knows his stuff. He calls himself a master of hilarity. Translation: He’s a certified laughter yoga leader, massage therapist and ordained interfaith minister who does bereavement counseling. Laughter yoga, he explains, combines playful movement with deep breathing. So he may act goofy but he’s no goof. In fact, this is serious business with strict rules. What intrigued me the most was the ban on jokes. The intent, Ernie says, is not to try to be funny. “Fake it ’till you make it,” meaning forced laughter is fine at first. Eye contact is important because laughter is contagious. And in fact, it really is. Sorry pictures so bad. Was in such a rotten mood, forgot better camera. There was a lot of laughing on command, dancing, sticking out of tongues, and blowing up balloons to release tension. A lot of shouting Ho, ho, ha ha ha. Think about it, when you do all that, you’re working a lot of muscles. And there’s lot of deep breathing. That’s what makes this yoga. But a lot more fun. Trust me, nowhere else would I ever wear a name tag and clown nose and read silly verses in front of a group. (Ernie’s version of Shakespeare.) But I really got into it. Made a total donkey of myself. What fun. After an hour of this, my face had a charley horse. Clearly, I wasn’t used to laughing. My mood had noticeably brightened — and so had everyone else’s. While walking to my car, I noticed the town water tower was a dopey giant mushroom. Well, the place is known for its fungi. Normally I would scoff. But it seemed fitting because I was experiencing what I imagined a magic-mushroom high to be. Not that I would know. Really. And got into a buggy traffic jam on the way home. And didn’t even care. So there. Ho, ho, ha ha ha. 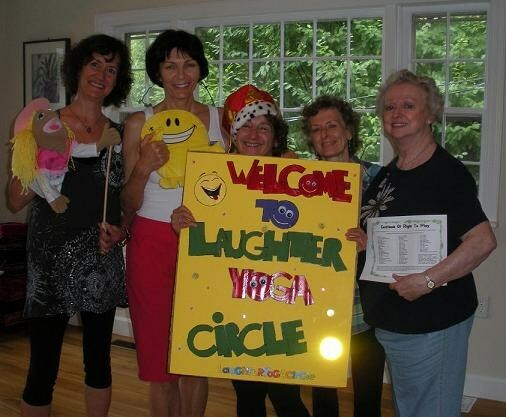 For more about laughter yoga, click here. This entry was posted in Health & Wellness and tagged Amish, health, Kennett Square, Lancaster County, laughter yoga, meditation, PA, wellness. Bookmark the permalink. Thanks for the kind words…and all your creative writing about what I do..In a world of so much sorrow,pain and suffering….Laughter Yoga speaks to me. I love spreading joy and laughter which in return promotes community, peace and heart to heart connection between spirits. Everyone…if you are reading this blog or comment…please be a Laughter Angel and tell someone you know about Laughter Yoga…Especially…your family and friends who may be experiencing temporary tough times in their lives…who could use a little cheering up and support from other.